The birthplace of green peas is South Asia. In Ancient Rome and Greece, green peas eaten only by the poor. And in France it was served for dinner to the kings. In Russia peas gained popularity only in the 18th century. Green peas refers to perishable products. For canning it is better to use unripe, as in this form it contains large amounts of vitamins. Wash green peas and separate the peas from the pods. Well wash the glass jar with baking soda. Boil water in the kettle. Reduce heat and remove cover. Put in a colander jar upside down. Soak each Bank over the steam for about 5 minutes, then the metal cap for one minute. In the end, cover the jars. Fold green peas in a saucepan and cover with water. If you use young peas, then simmer for 20 minutes, but if more Mature, over 25 minutes. Until peas are cooked, prepare the marinade. To do this, heat 1 liter of water and dissolve in it one tablespoon of salt and one dessert spoon with a hill of sugar. From the pan drain. Put green peas in sterilized jars and cover with marinade. In each jar on top, add one dessert spoon of vinegar. Banks immediately roll. Flip, cover, and hold until cool. Make sure that rolled banks to store in cool place, canned green peas good be stored for years. Green peas has a lot of useful properties. It is an effective way to lower cholesterol. Due to the fact that it contains the substance Inositol, green peas helps to prevent fatty liver in humans. Inositol metabolism and, thereby, prevents the accumulation of fat in liver tissue, which subsequently prevents the development of fatty steatosis. Peas are used as a prophylactic agent against cancer since it has anti-cancer effects. Has a beneficial effect on the skeletal system. Other useful properties of peas include: strengthen immunity, improve mental performance, relieve fatigue. 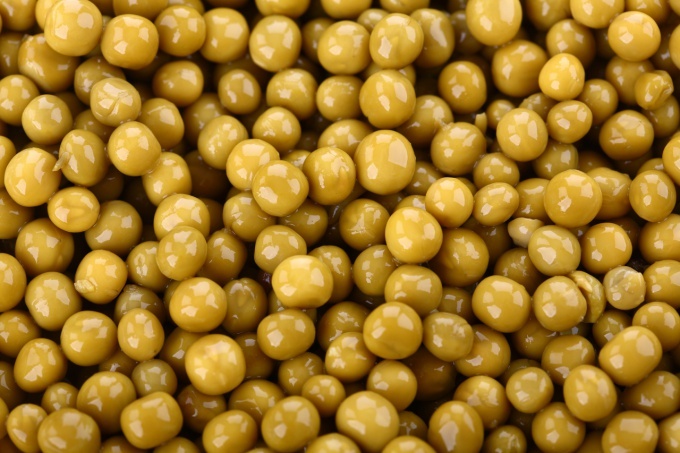 Green peas also contain proteins, which in its composition is close to the proteins of meat.